I want to begin with a caveat: It seems unfair to review a service which doesn’t have any compatible devices. However, just because there are no UltraViolet certified devices doesn’t mean you can’t watch UltraViolet movies. UltraViolet may be played through a web browser, or with a VUDU app. VUDU mailed me a trial for UltraViolet, the new digital lock box for online streaming video. I had to try it out. After setting up the account, they provided a list of movies to add to the account free-of-charge. I was very tempted to pick the movie Ultraviolet to be ironic, but I thought I might actually watch all of Underworld, so I chose that one instead. The Walmart-owned company, VUDU, is also promoting their Disc to Digital program wherein consumers may take a DVD they own to a Walmart store and purchase a digital copy to be added to their UltraViolet library. The movie I selected from UltraViolet appeared instantly in my VUDU account. The SD quality movie started immediately when I selected play with my ~10mbps internet connection. I was impressed with the quality of the SD content. Underworld is a dark movie with a lot of shading gradients, but there was plenty of detail. Obviously a HD signal would look better, but the SD quality of this VUDU movie was on par with other SD videos I’ve watched from Netflix and Amazon. UltraViolet requires multiple registration accounts to share the content. 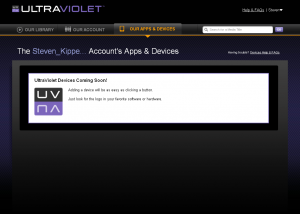 The first account was with VUDU, and the second was with UltraViolet. This account is obtained at uvvu.com. 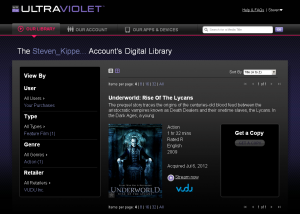 When logged into the UltraViolet site, all of your videos will be shown in the library. This library is separate and unique from the VUDU library – or Flixster, or whichever other UltraViolet service is utilized. 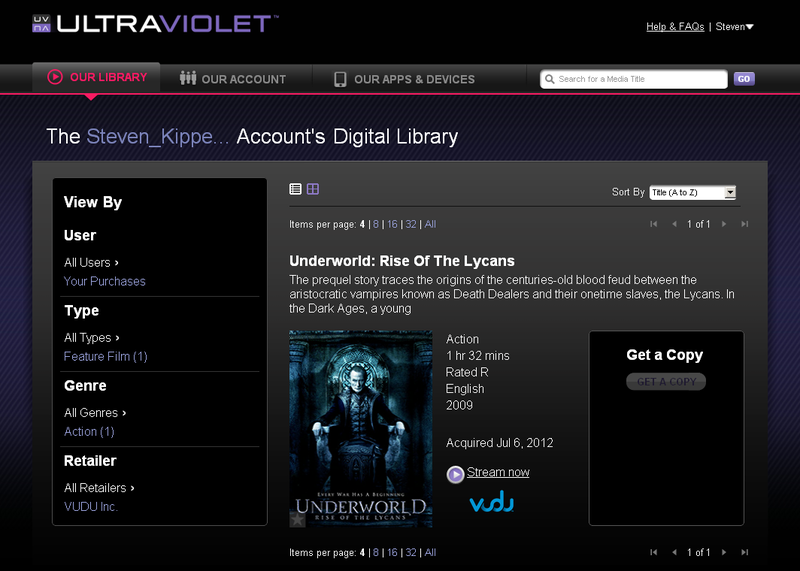 My VUDU rentals do not appear in my UltraViolet account, but my UltraViolet purchases are visible in my VUDU account. 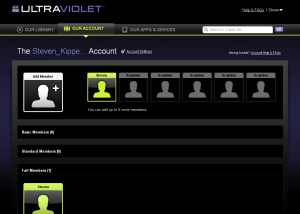 From the UltraViolet page, the user’s account is managed. Up to six users can be added to a single account, so potentially everyone in your family could have access to the UltraViolet library simultaneously on multiple devices. This is especially useful for families. Each user is assigned a permissions level. There are three permissions levels: Basic, Standard and Full. Basic can add movies and TV shows to the library, view personal member information, link retailers, and view apps and devices. The Standard permission can also stream online services, edit member information, add or remove Basic and Standard users, and add or remove apps and devices. The Full permission is the admin, including parental permissions and parental controls, adding or removing Full users, editing account information, and closing the account. Parental controls are set in the “ON” position automatically to lock down new accounts. The Full users may remove parental controls from a user, or set movie and TV ratings for each user. Additional parental controls include blocking explicit lyrics in albums, songs or music videos, blocking adult content for movies and TV shows, and blocking unrated content. Finally, the UltraViolet dashboard allows users to add devices or apps to the account. This feature has not been activated yet. As devices or apps are released into the market, this should be a single button press and a login to the UltraViolet dashboard. From this brief experience with UltraViolet, it appears my fears of a disjointed system have been misplaced. The UltraViolet account is simple, easy to use, and will seamlessly integrate with devices and apps. I’m very impressed. I’m so impressed, I think you should try UltraViolet yourself.